At Power Ranch Dental we can help in the treatment of gingivitis. Different signs for gingivitis would be swollen gums, bleeding gums, persistent bad breath, loose or shifting teeth, etc. If you have noticed any of these symptoms happening in your mouth, stop into Power Ranch Dental and let us help take care of the gingivitis in your mouth. If gingivitis is left untreated, it will advance to periodontitis. A person with periodontitis, the layer of gum and bone pull away from the teeth and form deep pockets. These small spaces between the tooth and gun can collect debris and become infected. 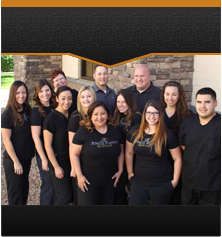 If you have any other questions, give Power Ranch Dental a call at (480) 988- 2282. We look forward to meeting with you and answering any and all questions you may have.